A bloody, vicious, war rages on in all corners of the European continent and more countries are drawn into the conflict as time goes on; by 1916 it was year two of four into the gruesome war that would eventually be titled World War I. Meanwhile, in the quiet isolationist focused nation of the United States on a warm first day of July in Colorado, a 25 year-old man married his 19 year-old sweetheart. This man, an Army Lieutenant in 1916, was future president Dwight D. Eisenhower and his sweetheart was future first lady, Mamie Geneva Doud. The now infamous couple married earlier than they had planned since there was no end in sight for the European conflict, on Ms. Doud’s family farm in Denver, Colorado. Denver, by 1916, had proudly received the nickname “the cow town of the Rockies” after the railroad had made its way to the relatively young town. A child of the early part of the Western Gold rush the town eventually became a place for settled miners, farmers, and travelers to rest. As a central location to the rest of the Union it was not uncommon to see frequent agricultural and livestock shipments brought to the town. Due to the population of cattle, sheep, and other livestock, Denver soon began to host the Denver Livestock and the National Western Stock Show thus giving it the cow town name. Denver was not only comprised of cows and gold, it was also home to the relatively new Denver Mint. 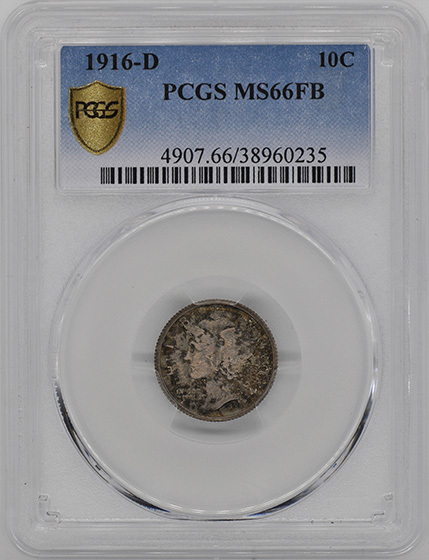 This mint, meant to serve the westward mid-country states, was a prime component of dime production and was the birthplace of one of the rarest strike dates in the entirety of the Mercury series; 1916-D.
As usual, the turn of the century brought new ideas, inventions, and the desire for change to the world. Congress and mint officially even thought it was time for coin design changes as well. 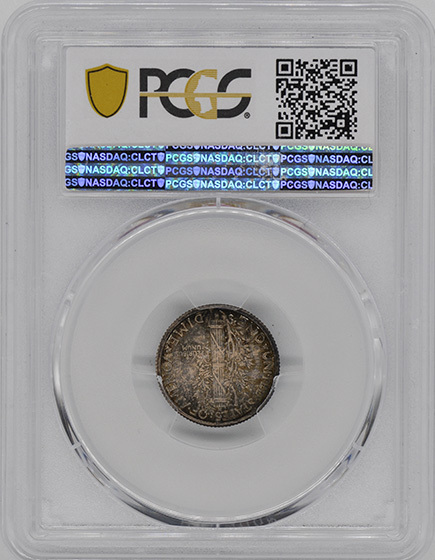 Consumers had enough of the boringly designed Barber dime from 1891 that had been a pain from the start to even get a design from endless egotistic and picky engravers. Thankfully, prior to the Barber dime release Congress passed legislation in 1890 that set a minimum of twenty-five years of circulation before a coin could be redesigned, and 1915 marked that year for the dime. Mint Director at the time, Robert W. Wooley scrambled to find a new design; it is likely that Wooley misinterpreted the minimum legislation law as stating that coins HAD to be redesigned rather than COULD be. In order to choose the design faster, Wooley invited three renowned engravers to compete for a coin since the dime, quarter, and half dollar all “needed” to be redesigned. It was originally planned to award each sculptor a coin, but upon review Adolph. 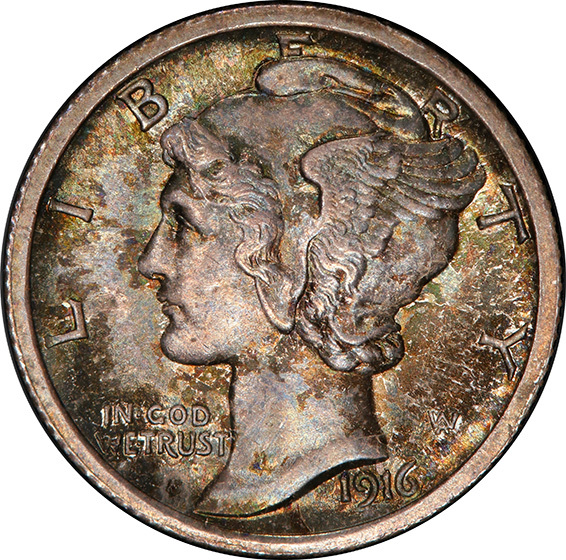 A Weinman was given both the dime and half dollar. Born in Germany, Weinman moved to the United States at ten years old and not long after studied under the increasingly popular Augustus Saint-Gaudens with whom he was able to refine his skills and become the youngest renowned sculptor in the world. Weinman’s prize design not only won him two coins but also won the hearts of the public and collectors to this day. 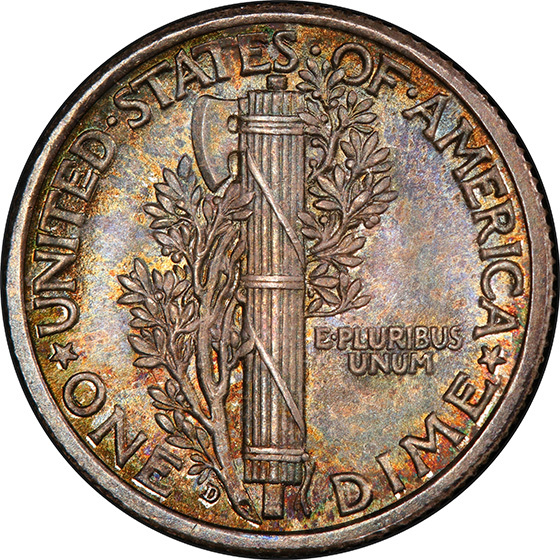 The falsely titled Mercury Dime depicts Lady Liberty in a cap that dons wings to symbolize the new ideal of free thought in America. 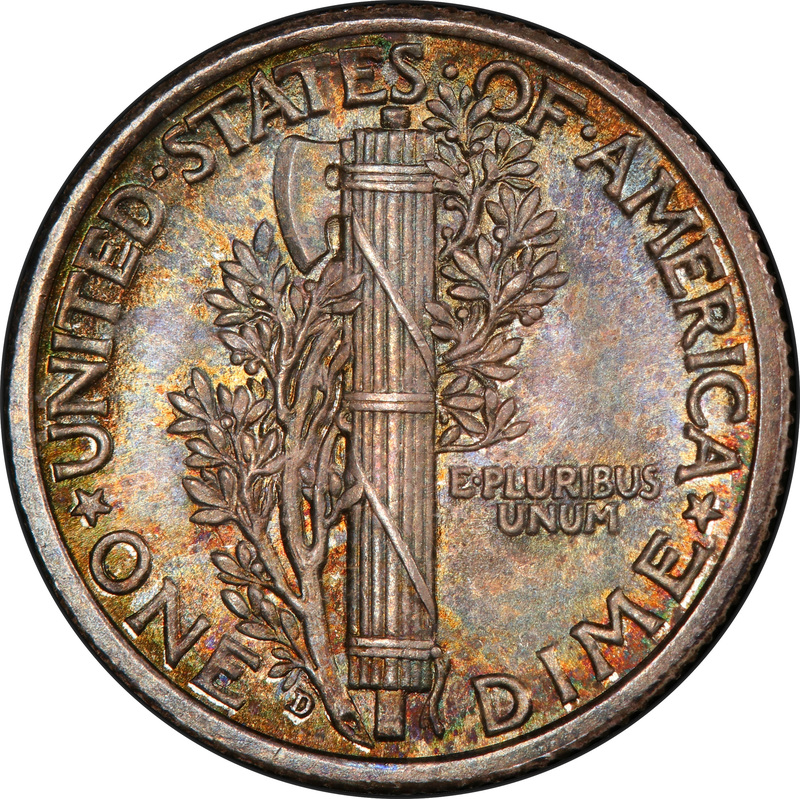 The reverse shows a battle axe wrapped in rope and sticks, or Roman fasces, and an olive branch to symbolize American battle readiness but our ultimate will for peace.